With less than two weeks until Chicago elects a new mayor, corporate lawyer Lori Lightfoot is backtracking from statements made during a March 13 mayoral forum on public education at the University of Chicago, where she said, “And let us not forget, we got 38 schools that are vacant from the school closings…some of which can be repurposed to help us with our training needs in the police department.” The comments sparked nationwide backlash from public education advocates, activists and members of school communities destroyed by Mayor Rahm Emanuel’s record number of school closings in 2013. Lightfoot’s remarks also raised serious concerns about her ability and willingness to move the school district forward for the schools our students deserve. Lightfoot’s callous proposal is the subject of a digital ad released by the Chicago Teachers Union this week, which opens by asking who is “the real Lori Lightfoot?” followed by her remarks at the March 13 forum. Next are striking images from the spring of 2013, in which parents, students, educators and thousands of Chicagoans marched through the streets of the city, rallied downtown and were brought to tears by Emanuel’s attack on their schools. Click here to view the full video and learn the truth about Lightfoot’s agenda. “A better idea would be to invest in our schools and provide affordable housing, health care and living wage jobs to help school communities thrive,” Sharkey added. In addition to her plan to repurpose closed schools, Lightfoot has taken no stance on issues of concern to CTU members. 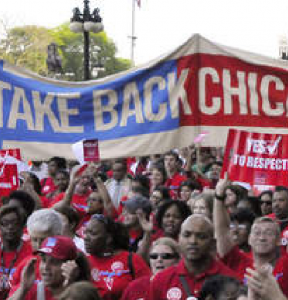 Cook County Board President Toni Preckwinkle, endorsed by the CTU House of Delegates, supports expanding bargaining rights for negotiation on class size and special education staffing; increasing the number of counselors, social workers, school nurses and other clinicians; and ending job outsourcing such the failed Aramark janitorial deal. Lightfoot has been silent on expanding bargaining rights that are central to our work as a union of educators, at the same time she’s been endorsed by a growing number of political players and Emanuel supporters, from Gery Chico and Paul Vallas, to finance executive John Canning. On the issue of school funding, President Preckwinkle supports fairly and equitably funding schools through new progressive revenue streams and TIF reform, while Lightfoot said in a Jan. 17 student forum, in response to a question about funding our new contract, “We can’t negotiate and give away dollars we don’t have.” No one is asking for that. 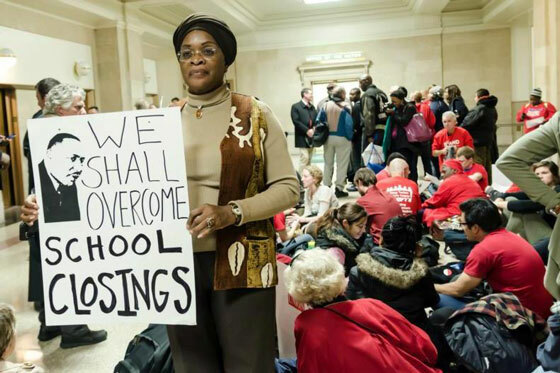 We are, however, demanding that the wealthy—some of whom are her own donors and Emanuel allies—pay their fair share and ensure that the dollars “we don’t have” are found for our schools. 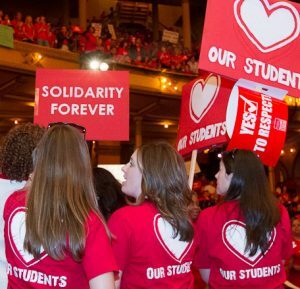 Finally, the CTU is a union of educators dedicated to fighting for economic and social justice. Toni Preckwinkle is committed to ridding the city of the gang database and has a long history as a champion of racial justice and reform of the criminal justice system—including by expunging juvenile records and curbing cash bail. The Lightfoot record is troubling. In her work as both a private corporate attorney and a public appointee for the Richard M. Daley and Emanuel administrations, she has played a role in the turmoil that exists between the police and many communities of color today. Lightfoot has said nothing on the issue of policing in our schools—many of which do not have nurses, social workers or counselors. Instead of clearly being an advocate for the people, she has spent decades playing both sides of the fence. The Union and our supporters need answers to where she stands on these critical issues, because while Lori Lightfoot is not Rahm Emanuel today, there is no certainty that if she is elected mayor of Chicago, she won’t become Rahm Emanuel after April 2. President’s Sharkey’s comments are in reference to a report this week of Emanuel’s personal lawyer, Michael Forde, being among the hosts of a March 19 fundraiser Lightfoot’s mayoral campaign.